If you start using the Oracle Cloud (OCI), you want to of course have a good understanding about your spending. The Oracle Cloud provides you with some special tools to manage your consumption. One of them being cost-tracking tags. 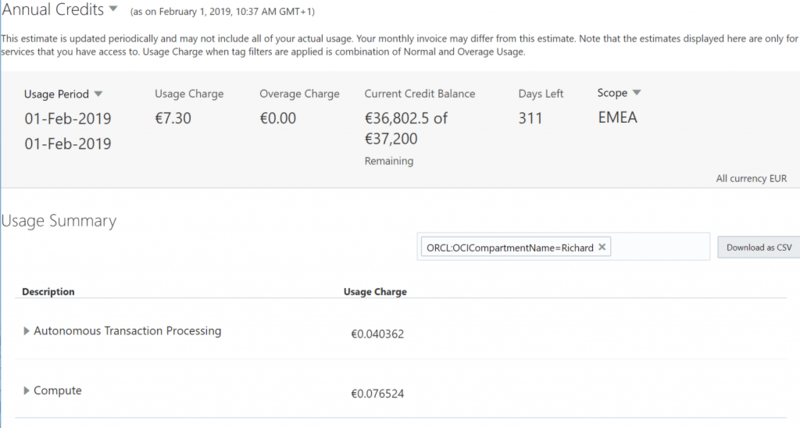 On each object / service in the Oracle Cloud you can apply cost-tracking tags, these tags can then later be used in consumption overviews to understand what the money was spend on. In the “My Services” dashboard you can view the consumption based on the cost-tracking tags or compartments. If you want to do some automation around the consumption, the Oracle Cloud offers an API for this. This is a different API then the OCI API and requires just an username/password instead of ssh keys. Martin Bridge, an Oracle employee has written a simple example in python on how these API’s can be used. Very nice stuff. I have a short question, where do you get the details of the domain and idcs_guid? Go to the “My Services Dashboard”, if you are in the OCI portal, you can find this link in the “Administration” menu. Click on the “4 horizontal lines” icon from any service and chose “View Details”. If you do not have any services show, click on customize dashboard to have a service displayed. On that page you will find the domain in the field “Cloud Account ID” and the idcs_guid in the “Identity Service Id” field.